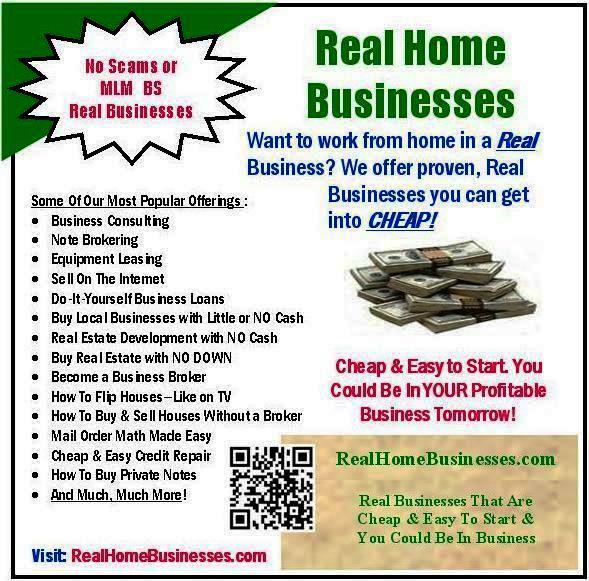 RealHomeBusiness.com As the name indicates, these are REAL, Proven businesses that can be started and run from home. 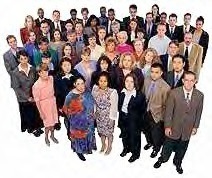 REAL also means that there are no scams or MLM (Multilevel Marketing) included in our offerings. If you are willing to work, our offerings can show you how to make money. We have also included some fun offerings too. How These Businesses Started: The Home Businesses included here are “Real” home businesses, meaning that I personally have profitably worked these businesses over the years. I have developed all the business working tools such as forms, contracts, Excel spreadsheets etc. and I have used these tools to work these businesses. These home businesses are NOT multi-level and do not require you to sell the business plan to others so you can profit from their efforts. These home businesses provide you with the tools to make a sizeable income but you have to work the businesses in order to prosper. The idea of working from home in a home business continues to gain popular appeal especially as gasoline prices continue to rise and also the overall cost of doing business. Working from home you incur no additional business rent or utilities to accommodate your business and you can work it whenever you choose; weekends, nights etc. Given a choice, most people would choose to work from home and if it’s good enough for the President of the United States to work from home, it should be good enough for you too. When I started working from home in my first home business I started with a Mortgage Brokerage business, since I had extensive experience with real estate and finance. I gathered all the necessary forms and contracts and work sheets and started to advertise and do business. When others saw me being successful with my home business working from home they often asked me how I did it and I would take the time to assemble packages for them consisting of the tools I developed and explanations on how to work these home business and gave it to them. As these requests became more and more frequent, I pre-packaged all the info so when it was requested I could email the complete information to them quickly so I could get back to work on my own stuff. Many of the recipients of these packages kept telling me that I ought to sell them so I decided to do just that. Be sure to check out all out products as I'm sure you will find something you can use and profit from. Think of how great it would be for you to work in your own Home Business; no expensive commuting or parking or meals out every day. Come to think of it, the President of the United States works from home so I guess you could say he has a home busimess too. How Offerings Expanded: Over the years I have been in many different businesses and continue to work from home in business consulting, business analysis and appraisal, small business profit development, real estate development, flipping houses, note brokerage, etc. Business is fun, especially when you make money doing it and can do it from the comfort of your own home and set your own hours and dress like you want etc. I had the time to coach my kid’s sports teams and pursue many of my own interests too. When I work on stuff for either for business or pleasure, I like to catalog what I did to be successful and eventually people would ask for my advice and I could give them the results I cataloged. This made it easy for me to help them and they really enjoyed the information as it helped them immensely. These other endeavors went from baseball to poker, blackjack, golf, getting deals at local auctions, buying & selling cars and houses, buying private notes, retirement planning, football picks, knot tying, music, horse racing and the list goes on and on. If you are interested in starting your own home business and working from home, take a look at our offerings. All these offerings are geared to quickly and inexpensively put you in business. These business packages contain the real tools that I used and continue to use to start and work these businesses. We encourage you also to review our other offerings too as there is much sought after information on many subjects all priced to fit everyone’s budget. or most major credit cards and debit cards.